The professional & certified sweeps of Chimney Solutions provide chimney services in Buford GA and the surrounding towns and communities of Woodstock, Gainsville, Alpharetta, Canton, Brookhaven and more. We provide a full range of chimney maintenance needs from chimney cleanings & inspections, chimney rebuilding, chimney cap installation, chimney relining, firebox replacement, and even chimney waterproofing. Our high standard of workmanship & reliable service have helped us maintain a superb reputation with satisfied customers throughout Buford GA. Every year, homeowners return to us for their annual chimney inspections and cleanings. Chimney chase cover replacement, chimney liner repair, and chimney damper installations are just a few of the services we specialize in. Most of our business comes from recommendations by happy clients. 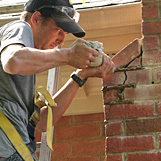 Each & every certified chimney tech for Chimney Solutions provides quality work and fantastic customer service. We will always arrive on time, in full company uniform, and in a clearly marked company vehicle. Once you work with us, it will be easy to see why we get so much word-of-mouth recognition! It will be easy to spot our distinctively marked company trucks as they travel up & down Interstate 985, Rt 13, & Peachtree Industrial Blvd and across Hamilton Mill Road and Shadburn Ferry Rd. Our friendly & knowledgeable professionals deliver top quality chimney sweep services like chimney inspections, chimney cap installations, chimney crown rebuilding, smoke chamber parging and even fireplace & heating stove installations. Serving the town of Buford, from Sugar Hill Station to Buford Dam Rd, you’ll see us completing work on chimneys across the town. Every job completed by Chimney Solutions represents the highest of industry standards. Our attention to detail and dedication is what has helped us become the chimney sweep of choice for the Greater Atlanta area. We are fully insured to work on our home and our trained professionals will always offer you fair prices and a full explanation of recommended services. We are good standing members of the National Chimney Sweep Guild and the Chimney Safety Institute of America. Our goal is to remain on top of ever-changing best practices & industry standards, and ensure that we are offering the best & most effective hearth & chimney products. Customer safety & satisfaction is our #1 priority and that’s why residents of Buford trust us with all of their chimney needs. Hiring a chimney sweep? Read this first! There are a number of unscrupulous “chimney companies” across the state that are out to scam unknowing homeowners. They call or run ads offering low, low prices for common chimney sweep services like a chimney cleaning or chimney inspections. Their goal is to use the low prices to score the job, then attempt to upsell the homeowner on expensive repairs & services once they are on site. In most cases these services are neither required nor necessary, but since most homeowners don’t know the current condition of their chimney system, they must take a chimney sweep at their word. If you don’t agree to service, they perform a shoddy cleaning or inspection to get done with the job and move on to the next unsuspecting victim. Don’t pay more than you have to for chimney maintenance and don’t let the safety of your fireplace & chimney system rest in the hands of untrained & uninsured individuals. Burford GA Chimney Contractors offer service for fireplaces, stoves, fireplace inserts, chimney & venting systems. Trust the professional chimney sweeps of Chimney Solutions to help maintain a safe & efficient chimney. Jul 06, 2017 by Suzanne S.